We had entered the gravitational field of home two weeks earlier, as soon as we left the Mojave. We had hoped for a last week of dislocation, travelling along the Sierras and hiking in Yosemite, but given the weather and pre-registered crowds, that was not to be. So we travelled up the North Coast, with an ever-deepening sense of familiarity, as the landscape, buildings, vegetation, and weather made it clear that the alien environments of the past year were behind us. 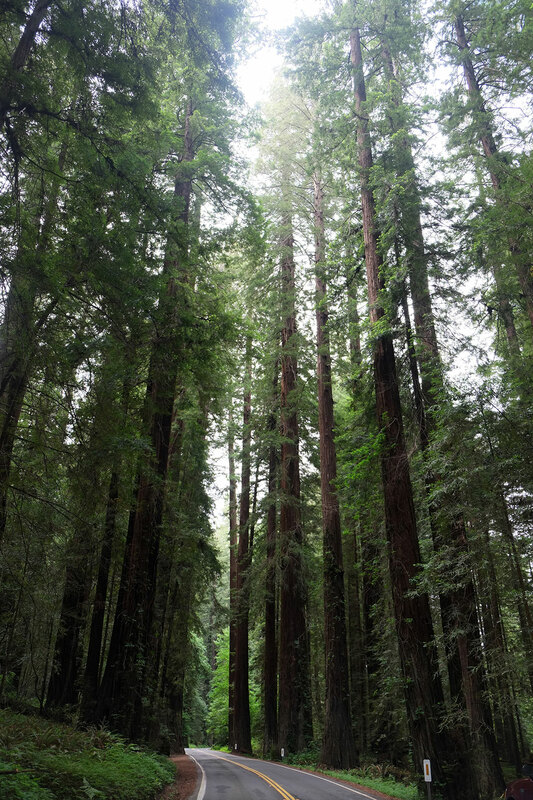 We wound our way through the last miles of Highway 1 to Leggett, where we joined Route 101, and were suddenly in the redwoods. Most of the land through which you travel is private timberland, but there are big stretches of state and local parks and reserves. 101 runs about 75 miles along the Eel River, all the way to Humboldt Bay. Near Phillipsville we abandoned 101 for the Avenue of the Giants. This was the original alignment of Route 101 until 1960, when the newer and straighter highway was built, usually on the other bank of the river; the two routes intertwine and switch sides a few times. It is a great road, with many quiet waysides and short hikes, away from the speeding trucks and heavier traffic of the highway. But we would have taken it anyway, just for the name – after a year on the road, we are suckers for all such grandiose touristic nomenclature (although we did manage to avoid the Trees of Mystery further north). We bypassed the fabulous town of Ferndale, and quickly cruised through Eureka and Arcata, all of which we had explored in greater detail a few years ago. We knew we would probably visit this area soon again, and the gravitational attraction of home was increasing exponentially. 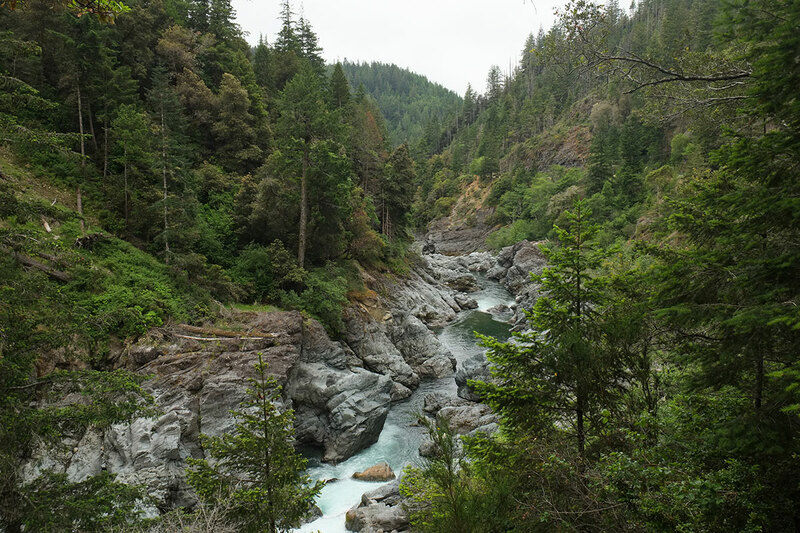 Humboldt County is a funny in-between place for us – travelling through the last time, I realized it is not so much Northern California as it is Baja Oregon. It is certainly part of Cascadia, the rainy, temperate region where the salmon spawn. Coming from Oregon it feels different, but coming from the south at the end of a long trip, it felt so much like home that we thought we might as well just go home. 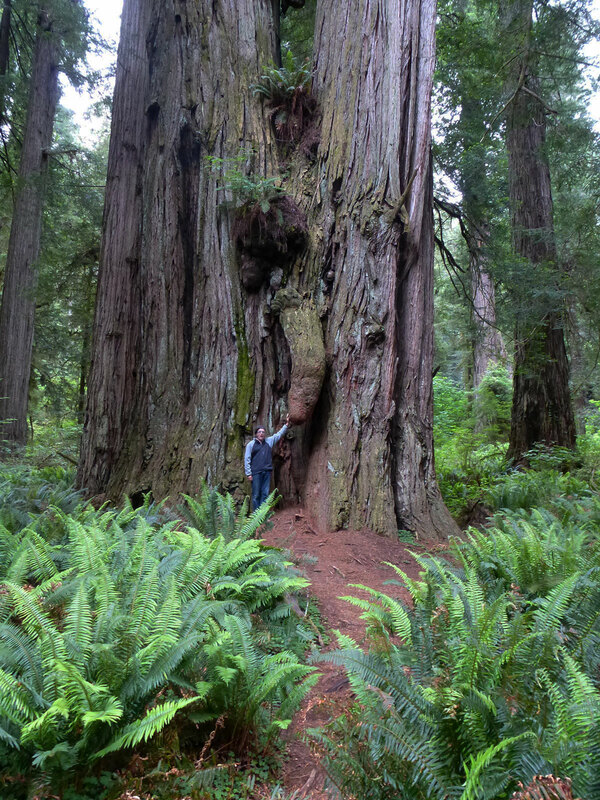 We drove into Redwood National and State Parks, a unusual designation I’d never understood, but we learned that there had been state parks here originally, which had then been encapsulated inside the National Park, which increased their area and gave them a higher degree of protection. 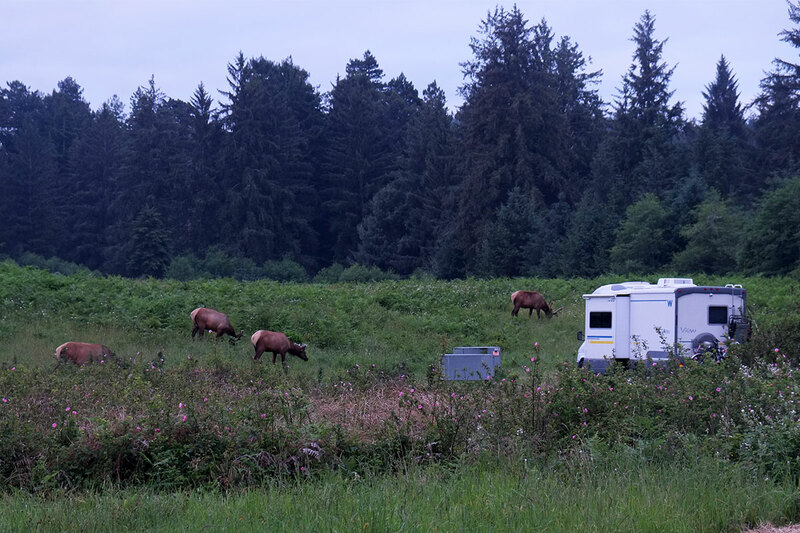 Our campground was at Elk Prairie, where we had selected a site in the redwoods rather than on the prairie, as Greta did not want to mess with elk while heading to the bathroom in the middle of the night. It was a chilly and misty evening, especially compared to the sunny days of central California, and we ate our last trailer-cooked dinner, left over from the Mendocino Cafe. Greta and I are not normally early risers, but we both awoke at first light around 6:00. We stared across the trailer at each other, with looks that clearly said, Wow, this it, the last day. We wolfed down some breakfast and went out for our last hike in a National Park, before anyone else was about. First we went to the prairie, where there indeed was a small herd of elk, moseying along while eating, and then heading into the forest. 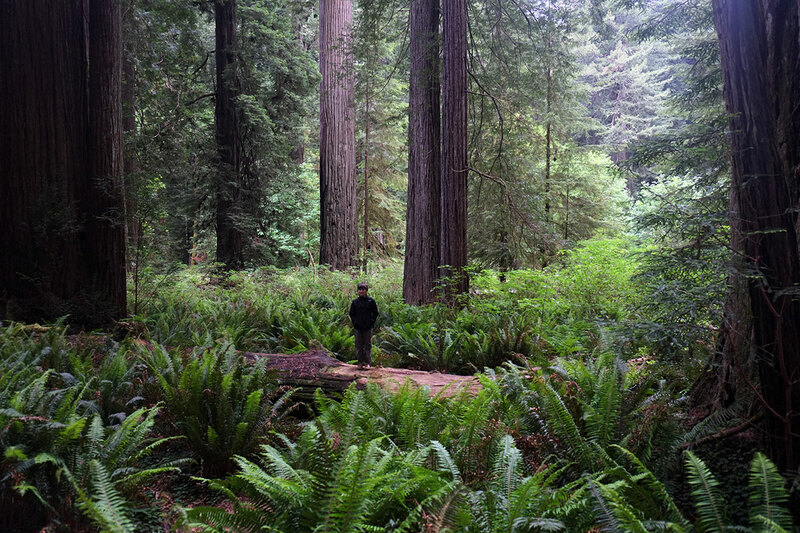 We found a beautiful trail from our campground, which wound along a creek and through the redwoods, with many close-up views of nursery logs, and closed-in vistas, rather than big landscape perspectives. In some ways it felt familiar – a dense, enclosing, coniferous forest, with ferns and a low understory, much like the park at the end of our block. But we then we realized that things felt familiar, except for the gnawing sense that something was slightly off, in one important way. The trees were enormous compared to ours, maybe twice as tall, but many times bigger in girth. 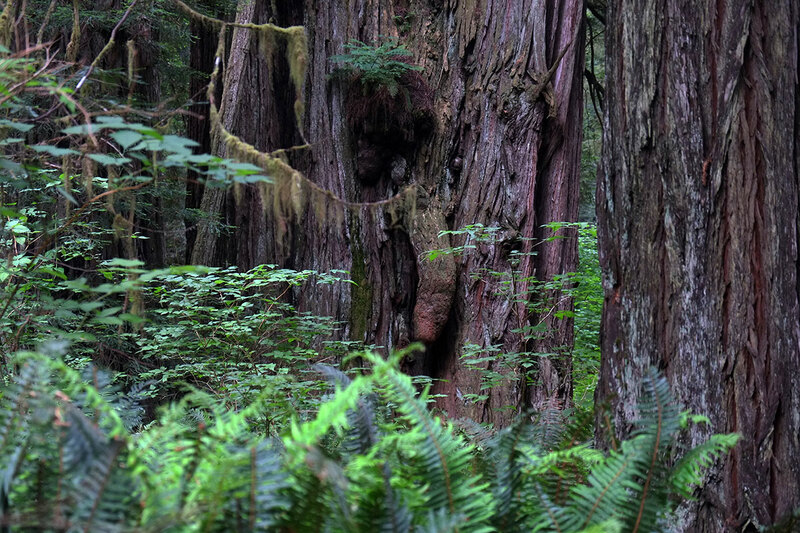 To a Northwesterner, the redwoods are dreamlike, trees out of myths. Our second night out on this trip, we had made it to Craters of the Moon National Monument, which Greta had likened to Camping in Mordor. So it seemed appropriate that we spent our last night in Lothlorien. We packed up the trailer, and once again were able to avoid 101, driving on the Newton B. Drury Scenic Highway, most of the way to Klamath. 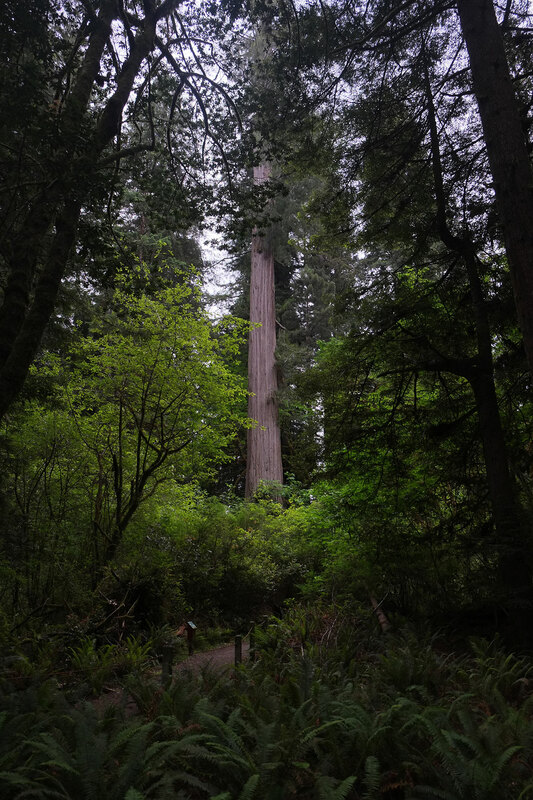 There were many waysides and areas of interest, but one in particular grabbed our attention – a trail to the Big Tree. We wondered, what would it take to be called The Big Tree in this forest? Hiking along, we kept wondering, Is that the Big Tree? That one? Then up ahead of us, we glimpsed something strange through the brush. 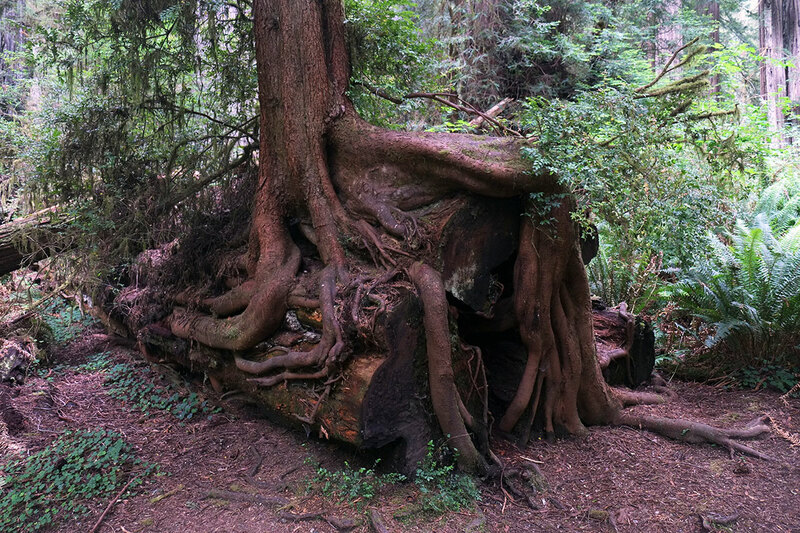 It was clearly The Big….Tree. We had never seen anything quite like it, although Sleeping Ute Mountain, and Face Rock at Canyon de Chelly came to mind. We marvelled at the Park Service’s circumspection. No matter what it was called, Greta had no interest in getting any closer, so we continued on with our intermittent hiking and driving. We reached Crescent City in time for a Second Breakfast, and decided to explore. No one ever goes to Crescent City, as it is one of those in-between places, which you pass when you’re always in a hurry to get somewhere else. After a closer examination, we can state that there really is nothing to see there. It is a bedraggled place, which reminded me of Aberdeen, Washington – another depressed coastal town showing the changes in the timber industry in the past decades. It seems that now the major industry in town is the Pelican Bay State Prison, the only super-maximum security facility in California. At Crescent City we turned inland onto Highway 199, heading towards Cave Junction, Oregon. It’s a beautiful road in the Smith River valley through the mountains. We noticed the stickers attached to the bottom of the sign, which seemed to reflect the major pre-occupations of the local populace: the secessionist State of Jefferson movement, and the marijuana culture which had sprung up in our absence, as recreational use was legalized on October 1, 2015. We drove a few miles more into the town of O’Brien, where we passed, in rapid succession, a white guy with dreadlocks and a tie-dye t-shirt riding a too-small mountain bike, an alternative medicine clinic, a Frisbee golf course and a cannabis store. Greta looked at me and said, Dad, I think we’re home. On to Grant’s Pass, with a large amount of traffic confusion for a small city . We ditched our small-road predilection and joined the great river of I-5, for the first time on our trip, anxious to move on. 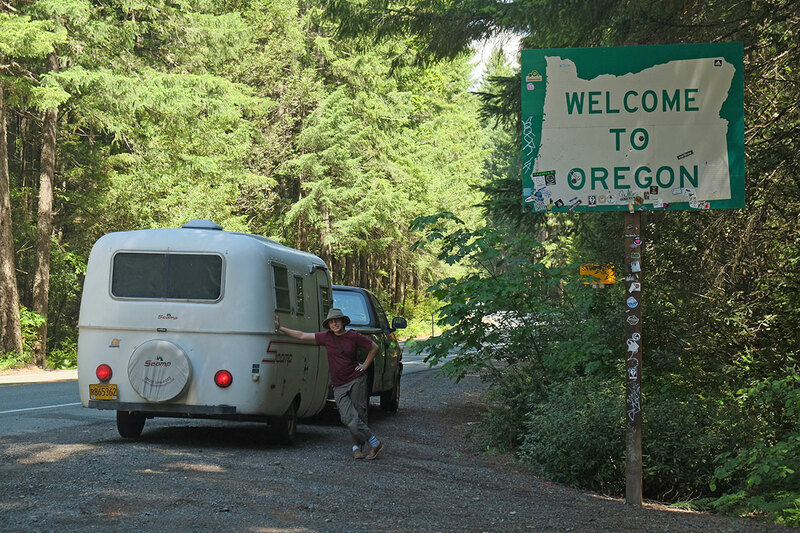 We had forgotten the propensity of Oregonians for staying in the left-hand lane at all times, even when driving a tractor-trailer up a hill at 25 mph, and we longed for the speed we had left behind in the south. But as we left the mountains and neared the Willamette Valley, the speed picked up, and the afternoon rushed by. About 40 miles south of Eugene I said to Greta, I think this is the point where we’re supposed to have a heart-to-heart conversation about the trip, what it’s meant to us, and how we feel about it now that it’s coming to an end. There was a long silence as she stared at me. Or, I said, we could just put on the Clash. Definitely the Clash, she replied. So we put in London Calling, which had become our go-to album for the whole trip. 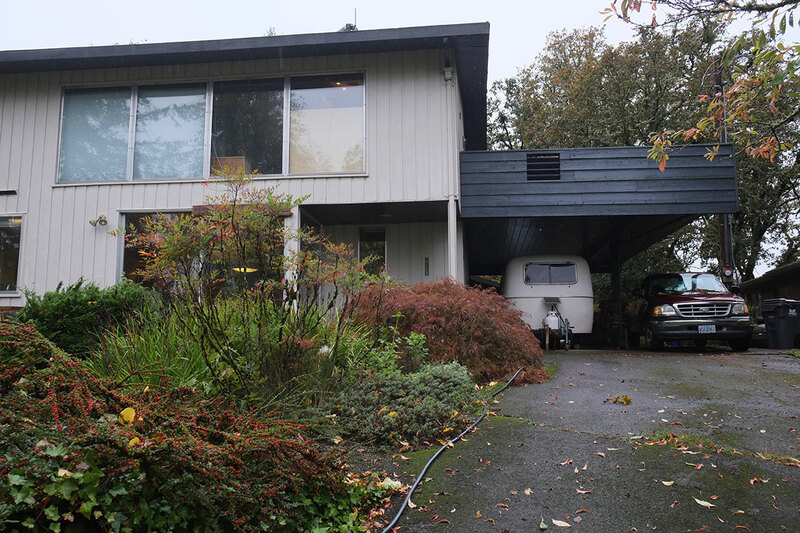 Everything around us became very familiar, as we glimpsed our hill from I-5 as we came around the big bend in Glenwood, got off the highway onto Franklin Boulevard, went past our grocery store and turned up the hill to our house. We pulled into the driveway just as the last chords of Death or Glory crashed down. I had warned Greta over the past weeks that I thought we should disrupt her no-displays-of-affection protocol, and that one hug at the end of the trip would not be too much for her to handle. So I stood by the front door, and said, Hug. Greta walked over and hugged me, then we went inside. He drew a deep breath. ‘Well, I’m back,’ he said. 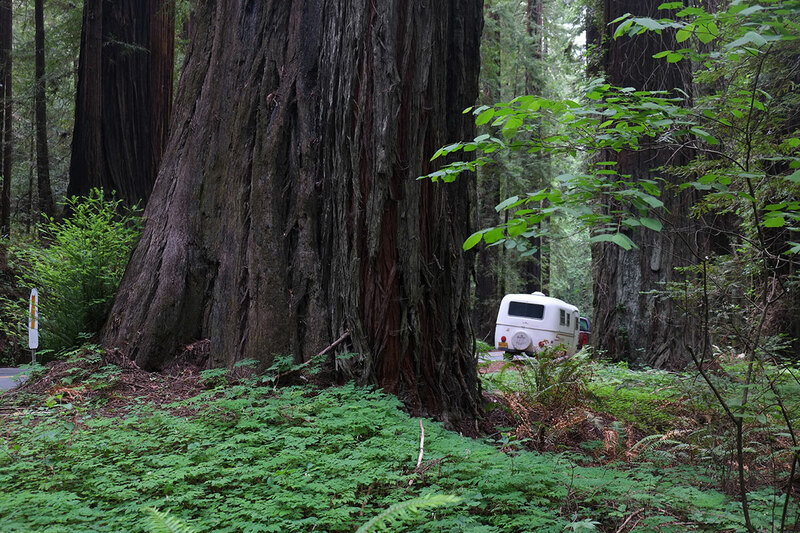 This entry was posted in landscape, life and tagged #vanlife on May 25, 2016 by Peter. Thanks. And so it ends.